La Dolce Vita - Italian style Night life experience! You must be a member of the Munich Italiani Group to attend this activity. Would you like to join this group? Vivete un'indimenticabile serata italiana con una live band italiana, con i migliori vini italiani, i migliori piatti italiani e cocktail di qualità! LA DOLCE VITA - Una nuova esperienza di vita notturna in stile rigorosamente Italiano a Monaco di Baviera! Cena: Prenotazione via telefono (39€ invece di 49€ per i membri registrati di Internations, vini esclusi). Live an unforgettable Italian evening with an Italian live band, with the best Italian wines, the best Italian dishes and quality cocktails! LA DOLCE VITA - A new nightlife experience in a strictly Italian style in Munich! Dinner: Booking by telephone (€ 39 instead of € 49 for registered members of Internations, wines excluded). 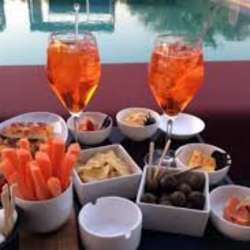 Erleben Sie einen unvergesslichen italienischen Abend mit italienischer Live-Band, besten italienischen Weinen, feinsten italienischen Speisen und italienischen erfrischenden Cocktails!